Here are a few practical ways to do this, with musicians at your local church; the central theme within all of them is growth based on individual, sustainable development. In a short phrase: maturity over production. Unless your church’s budget can handle hiring professionals, your team is probably comprised of volunteers from diverse musical backgrounds. Some churches are blessed with large volunteer pools and talented, experienced members. But many start out like I did: with little to no experience. This can mean time-consuming rehearsals and frustrating expectations. And in some cases, integrating solo instruments (viola, saxophone) means extensive arranging. Forcing all this busy work on musicians with varying skill levels – and busy schedules – can cause us to forget why we serve in the first place. To mature in this area, follow Ephesians; equip yourselves with musical training. Our team has monthly meetings where we disciple each member in relevant musical skills. Key rhythmic topics include the anatomy of a backbeat (“don’t clap on on 1 and 3!”), time signatures, counting in confidently, and subdividing with syncopation. Key harmonic topics include chord-scale theory (helpful for transposing) and voice leading (for solo instruments creating their own counter-melodies). Other topics include arranging based on the lyrics, dynamics, practice habits, learning new instruments, and critical listening. This can reduce rehearsal length, focus personal practice time, and develop each musician’s style, taste, and genuine creativity. All parts of the church body are diverse and equal; we church musicians are only a small part of various church ministries. However, people inevitably view those onstage with a higher level of frequency and scrutiny. So it’s important for us who serve in this way to understand what this means. Most immediately, it means that both newcomers and church members are paying attention to how you act on stage. If you’re noodling onstage while the pastor is praying, or if you’re falling asleep behind the drums, it can be distracting for those in the audience! Those of us onstage need to consider others, and reflect that in the details. Here’s a personal example: I try and refrain from wearing clothes with overly “loud” or “flashy” colors and designs. Our team words it in terms of four languages: body, verbal, musical, and lifestyle. These all reflect our church’s theology and vision. We need to be humble and aware; let’s reflect this in how we respond and repent of sin. First, a Gospel-centered church should value an individual’s heart and willingness to repent. In line with the previous point of musical training, a Gospel-centered music team should show patience towards its members, rewarding and encouraging growth. Secondly, a Gospel-centered individual understands that no matter how excellent or poor his performance is, it has no sway on his identity. Trying to meet high production goals can gets in the way of the church’s true purpose. Rather than rushing towards the perfect service, help your team understand their perfection as based in Christ, and in how they diligently respond to success and failure. Here’s a personal example; we all mess up the lyrics or chords to a song, but the effect depends on our response. If I make a visible fuss about it, it distracts people from the lyrics. But if I shrug it off, laugh, or continue to sing, I find the congregation tends to loosen up! This is not to say that we encourage messing up. But perhaps the congregation relates with the leader onstage, and are less intimidated when his response shows a care for worship over performance. This also applies to all ministries, and the church as a whole. In such a consumer-centric culture, we’re conditioned to expect the best, and it’s easy to take for granted when things go well; church is no exception! We want great production, smooth transitions, and an emotional experience. Complaints will arise when things go wrong, revealing that our hearts idolize the wrong things. And it also discourages those who are serving, who are earnestly trying their best as volunteers. So one way to deal with this is to acknowledge when things go well! Realize that perfection is not always going to happen – just like our walk with God – and appreciate little details and actions. Here’s a personal story: at our church, we currently lack a dedicated sound engineer. As a result, we often fight feedback from the pastor’s wireless mic. It’s really stressful! But we always appreciated the members who show appreciation when there’s little feedback, or when we’re able to fix it mid-sermon. And as music director, I try to make a point to notice – and recognize – when musicians make small creative choices. It shows that we as a church see details, and appreciate the effort and preparation necessary for a smooth service. It creates a culture that values maturity, while still encouraging excellence. In my opinion, this is the most crucial factor in church music. Our role as a music team is to point people to the Gospel story; however, any kind of witness to this is quickly undermined by lax lyrical standards. Why is this? Our worship is directed towards God. And theology dictates doxology; in other words, how we see God affects how we respond to him. But due to the aforementioned consumer culture that invaded the church, we find many lyrics putting undeserved weight on the worshiper’s emotions and actions, and too little weight on God’s attributes. Songs that overemphasize what we feel are inherently subjective, and have no grounding in solid theology. The Bible clearly states that following Christ won’t always feel great, but that suffering, service, and sacrifice are very much involved. In the face of this, overly emotional and theologically vague songs encourages soil with thistles and rocks: shallow and easily distracted (Matthew 13:1-23). Songs that overemphasize what we will do to please God are inherently works-centric, and don’t encourage a posture of repentance and humility; rather, they can create a culture unaware of its own frailty and need for a Savior. The Bible clearly defines the central protagonist of the story: Christ. Not us. Only singing about what we will do can set us up to be like Peter, who loudly promised to never betray Christ, yet buckled and denied him three times. Merely singing about feeling things (spiritual excitement, sorrow, or happiness) or doing things (creating ministries, increasing attendance, making great music) is completely inadequate, unless it is accompanied with a broken and contrite heart changed by grace. While it’s okay to sing about feeling or doing things, our musical attitude and lyrical choice must promote God’s glory; this vision feeds directly into point number 6. Many churches can be lax on lyrics, yet picky on musical expression. On a previous music team, I was rarely asked about my inner view of worship (see points 2 and 3). And I never heard anybody complain about the inaccurate theology we were singing. Yet complaints about musical style and production arose constantly. This reflected a priority for production over theological maturity. We like to judge musicians – or anybody else who serves – by our own consumer-centric standards, betraying an assumption that our opinions and satisfaction are the center of the universe. And yet we rarely question the shallow lyrics of popular worship songs, revealing how little God’s character really matters to us. While I agree that musicians should not draw undue attention to their own skill, the fact is that God made us unique for a reason! A part of respecting this gift is enabling, training, and freeing musicians to express themselves. After all, if churches want the music to sound just like the record, why don’t they just sing along with the record? One thing I am thankful for is our church leadership’s stance on music. Our team is comprised of musicians from varying skill levels, who love varying genres: show tunes, swing, punk rock, classical, fusion, and folk. And as long as the musicians’ expression is sensitive, and the theology is sound, everything’s fair game. The result is a plethora of ideas, and fresh takes on theologically sound lyrics. For example, we’ve done Come Thou Fount in 5/4 with horns, Before the Throne in a pop jazz style, and In Christ Alone with a clave. There’s no real way to fake this with stricter production. 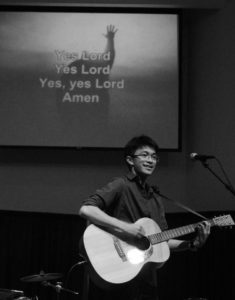 Retaining the creative excitement of music helps musicians discover and develop their unique musical fingerprint, while singing Scriptural truths. And congregations notice the contagious enthusiasm. If there’s anything I’d like to emphasize, it’s this principle: individual maturity over production. When we approach building a great music team – or any ministry, for that matter – we must understand that it is comprised of diverse people. And instead of seeing people as means to an end of outward excellence and production, we must see them as the recipients of our service. This service must lead them into healthy maturity, causing them to do the same for others. In the end, the goal of ministry is the maturity of individual Christians who, no matter if they remain at your church or not, point to the Cross in every sphere of their life; I hope our musicians would do the same.